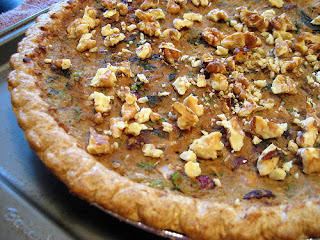 *chickpea tart recipe now posted! In Canada, we celebrated Thanksgiving (or, should I say "happy turkey day"?) back in October. Now that we are approaching the US Thanksgiving, there are even more ridiculous and twisted cartoon images of happy and dancing turkeys, and of course an overabundance of commercials, ads, and cooking demos featuring turkey. This time of year is all about the bird, isn't it? Well, not from the perspective of the chicken, duck or turkey. I posted this video on fb the other day. If you haven't seen it, and you are eating the odd bit of chicken or turkey (or 'free range' stuff), please watch it. It saddens me to see how ignorant we are of the cruelties placed on animals just so we can "honor" our traditions. How about honoring life? How about creating new traditions? Thanksgiving is not as ramped up in Canada as it is in the US, and I truly don't have many significant memories of Thanksgiving dinners (apart from one when I was pregnant and nauseous, those memories don't easily fade)! But, Christmas is not much different in how we choose to eat and celebrate. And, I have plenty of memories of eating turkey dinners with all the trimmings. Once married, and hubby and I were living in our own home, I decided to create our own tradition, a kinder, healthier tradition. And, instead of going to our parents to eat, I decided to invite them to our house for dinner. Why not? I thought it was a nice gesture as well - our parents had been cooking for many family members their whole lives, why not return a beautiful dinner for them. That was over 15 years ago, and our parents loved our dinner. I remember them saying they never felt better after a Christmas dinner, and I also remember how lovely it was knowing that they weren't doing the cooking. Not only did they get a break - but so did a turkey! Now that we have children, I love hosting our Christmas dinner. I love that we have created our own family's tradition that we honor and cherish every year - and that will become memories for our children years from now. Why not think about making a change yourself this coming Thanksgiving and Christmas? Opt for a meat-free menu. And, instead of going to your parents for dinner, why not try and host the dinner yourself? You can always ask guests to bring a side dish or dessert. Put it all together and demonstrate what an entire vegan holiday menu can look like! I'm going to try and make it easier for you. Many of you are familiar with my Christmas menu. If you'd like to try some other recipes, look into the Bountiful Vegan Thanksgiving e-book. This is a collection of holiday recipes from different vegan cooks, which has been compiled by Nava Atlas. This year, Nava will be donating profits from this project to Women for Women International, International Justice Mission, Farm Sanctuary, and Oxfam. Thanks for posting this Dreena. Wishing you a happy and peaceful Canadian Thanksgiving. My grandmother always made an eggplant parm for my vegetarian aunt and uncle to eat at holiday meals, yum! What a great quote. It really puts into perspective the harsh reality of your "traditional turkey dinner"! I've been vegan for a few years, it's one of the best decisions I've made in my life. Thanks for providing such delicious recipes, I love your books! I just bought your cookbooks. Which recipe should I try first? Thanks for the great ideas! I'm trying vegan for the month (normally vegetarian) and have been looking for dishes to bring to our family's dinner. The stuffed squash looks yummy! Thanks for taking the time to respond! All of the recipes you listed sound yummy. Yes, I have TEV, so I'd love to hear where you think I should start there. I am in love with hummus, I'd love a spinach hummus recipe. I have 4 kids, so easy and yummy are high on my prority list. We all like beans. To give you a short history on my diet, I was vegan for about 4 years until my baby got eczema and when I stopped eating soy, it cleared up. I was relying heavily on soy, so I no longer knew what to eat. After weight gain from pregnancies, chronic fatigue, (I am sure some of it could be attributed to food, but when I look at what Americans are eating, I am surprized that I am not rail thin!) I tried Atkins 3 separate times, but it only worked at first. Now I am wondering why I haven't gone back to eating vegan because I felt really good when I ate that way, and now I feel like I'd be confident to not have to rely on soy, if my daughter is still sensitive. I can't get my husband to read The China Study because he is really busy and has several books that he is reading, so I am hopng to add really great vegan food to our weekly meals more and more over the next year, so that he wont miss the meat. So, the more "tried and true" recipes I try the easier this will go. If I feed him any bad recipes, he wont be on board. For the phyllo dish made with rawsome nut dip, did you put the dip between each layer of phyllo, or put all the dip in the center? hi again Kelly (and sorry I'm just getting to you now)! There's a hummus recipe in ed&bv - "kid's dynamo hummus" where I give an option to make a green hummus with spinach - check it out! You could do a similar thing with the Creamy Hummus in Vive too. As for TEV, some of my faves - well, the Triple Layer Choc Cake comes to mind 1st, ha! ;) I have always loved the Neat Balls with Sweet and Sour Sauce. Recently I've been making the balls just a titch different (mostly the same, using oats instead of breadcrumbs, and a few other minor changes), and then serving up with pasta and standard pasta sauce. I also love the Spicy Thai Stew (looks different from the photo, I learned some things on that photo shoot! ), and Pureed Squash and Sweet Pot Soup, Mi-So Good Gravy (it's tangy, more than savory), Roasted Parsnip/Fennel Soup, Mushroom Pecan Burgers, Black Bean Millet Patties (have really good spices in them), Ginger Hoisin Noodles, and then also a lot of my holiday dinner comes from TEV - the side dishes and mushroom gravy, stuffed squash, etc. As for the phyllo with the nut dip, you can do it either way. In the photo of our Christmas dinner, I put a layer lengthwise and then rolled the phyllo into a long strudel type of thing. But, you could also put it in a dish and layer and then cut in squares. I found the rolling/strudel variation pretty quick, and it looked pretty when cut and served too! Thanks for sharing your history with eating vegan. Maybe you'll notice some changes eating a vegan diet this time, and perhaps you can include small amounts of soy and it will be fine for you and your daughter. Sometimes sensitivities change, and also maybe it was certain forms of soy that were irritating. But, certainly, as you mentioned, there are many options without eating soy. Many of our favorite and most flavorfual meals are from using beans, grains, nuts and veg - rather than relying on soy products. I still like them and use them, but there are definitely other alternatives! And, yes, I think if you can get your hubby to read The China Study, it might just be a game changer for him! Thanks, Dreena! I have a good starting point. Your books are some of the only ones where every dish looks yummy. I'll let you know how it goes. I have actually visited one of the few truly humane turkey farms out there as I am from Santa Rosa, CA (the home of Willie Bird). The birds are not the same birds that are domesticated, mate normally, really ARE free range, ect. Some people have a fundamental belief that eating any meat is wrong or harmful, and that's ok. But I don't think it's fair to make a sweeping generalization that EVERYONE who eats meat is doing X, Y, or Z.
I also had health problems like one of the other commenters from eating veg food only. I limit my meat as much as possible (1x a week or less) and I can't eat much dairy as I'm lactose intolerant. I should add that everything else I am making this Thanksgiving is vegetarian and much of it is vegan. I have made a vegan Thanksgiving before, but I have many omnis to please and they just didn't dig it. Tried for years and finally got sick of either only cooking my own food and having everyone whine about it or cooking two meals. So I found a balance between the two which seems to work best. Please put out that recipe! That tart looks fabulous!! I NEED to make it! My friends and I finally decided to try switching to vegan and give it a shot for a couple of days. I'm searching for great vegan recipe blogs and discovered your site! We will try and venture eating your dishes! Made the chickpea tart--very yummy! Thanks!